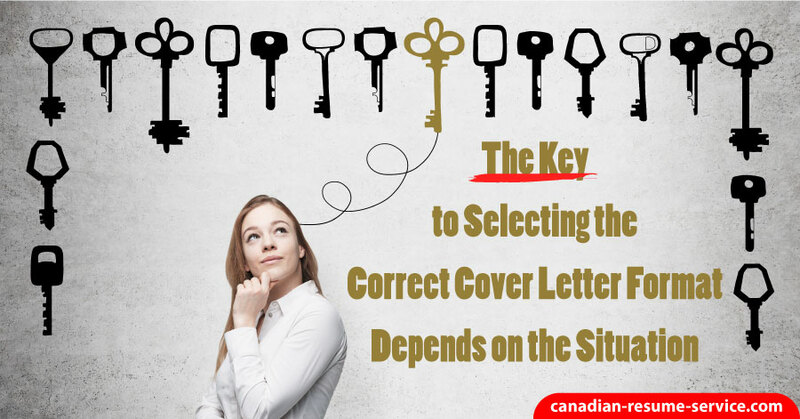 The type of cover letter format depends on the situation, keep in mind this is not the same as a cover letter template. You may write a broadcast letter, general letter, targeted letter for a particular job posting, networking letter, or a recruiter letter of introduction. When writing a cover letter to specific organizations or individuals you may need to be structured differently. Below we have briefly explained which type of cover letter should be used in each job search situation. They all have one common objective, which is to sell yourself to the reader(s) and get your resume reviewed to secure a job interview for the position of interest. The main sections include a unique introduction, relevant, convincing content—meaning showing how past work experience, skills, and strengths can fill the needs of the organization—and closing paragraph requesting an interview. A general cover letter is basically a letter that can be modified to suit your job search by making minor modifications to the name and address on each letter. This letter should still be dynamic to avoid looking generic. Targeted cover letters are more impressive and powerful because they are so specific and when it lands on the potential employer’s decide it stands out. You know the company, the decision maker’s name, the position sought and the message you want to send. It will help to find out what skills the company desires, and it’s philosophy and changes within the organization. Gather what information you can and use this to your advantage, demonstrating to the employer how you can be a great asset. Networking to uncover job leads accounts for nearly 85% of jobs opportunities and offers. It’s important to set up a network of friends, acquaintances, and other professional contacts. When addressing your letter, try to include the contact’s name in the opening paragraph to attract the reader’s attention and add credibility. The broadcast cover letter is a simple but effective variation. Much of the information will be taken from your resume since the purpose of the letter is to replace the resume. This type of letter often generates a telephone interview with a potential employer, even though the employer will usually request a proper resume. Highly successful executive individuals who are well established use this method of written communication to initiate their search. Business owners often use this type of approach to market their services. Mothers or fathers re-entering the workforce with little or no paid experience may use this variation to convey volunteer or real life experiences. Ask yourself how you can help the employer eliminate concerns and deal with problems. Communicate that you’re prepared to make the company a top priority. If you understand an executive recruiter’s role, the process of writing a cover letter will be simplified. Recruiters are hired to fill clients’ employment needs. They don’t work, for the job candidates. When writing the letter, it must clearly state you can be of assistance to one of their clients, not to the agency itself. These next five detailed cover letter tips will increase the interviews you secure. Recapture what kind of employee you are and convey what you can offer to the company. Express your enthusiasm for a meeting or speaking with the hiring manager/ potential employer and thank them for taking the time to consider you. The letter is an excellent place to list your language skills and your ability to travel or relocate. If you are not willing to travel or relocate do not mention it at all. If this is one of the job’s primary or secondary responsibilities, perhaps you should apply for something else. If you are delivering your job application documents in person or are sending them through the mail, you need to sign your cover letter. Black or blue ink is preferable, as they are professional looking colors, particularly black. Do not use red, green, pink, or any other color. If you are submitting your documents online or via email, you can add an electronic signature (scan and add your signature) or choose a nice script (i.e. Apple Chancery) to sign your letter. Your cover letter is just an introductory document. It does not need to include all past positions, credentials, etc. ; that is what the resume is for. However, you do not want your letter to be bare bones either; finding balance is the key. Keep it concise and easy to read. If you are finding that you cannot keep it to one page, then re-read your cover letter and assess what elements are necessary and which are not. Nothing looks more unprofessional than running these two documents together. It is fine to include them in the same job application package; in fact, that is the correct idea. However, do not write your cover letter in the top half of the page, with your resume following at the bottom half. No matter how much space is left at the end of your cover letter, start your resume on a separate page. When writing either your resume or cover letter make sure you don’t use flowery or unnecessary language. Keep this in mind particularly when writing your introductory paragraph for your resume, as it is easy to get carried away with yourself and seem pompous. Keep your wording honest, easy to read, and humble. This doesn’t mean dumbing down your accomplishments or the importance of past positions you held, but instead keeping your writing respectable and appealing to a potential employer. If you can remain consistent over the course of your resume and cover letter, it shows real potential for you to be a reliable employee as well. For example, if you are going to abbreviate states and provinces, make sure that you follow through with this throughout your documents. If the headers are centered, bolded, and size 12 font, make sure that all of them are the same. Make sure your contact information appears the same between both documents too. Make sure your writing is succinct for both of your job application documents. You do not want to drag on when explaining your job responsibilities. Keep everything brief and to the point. If your experience is in the same industry for the position in which you are applying, then the hiring manager should already know what each job entails. The same goes for the introductory paragraph of your resume. One paragraph or half a dozen or so bullet points should be enough to capture you as a professional. If you need help, let us know. We can help you secure interviews and land an excellent position even in a challenging economy!